BON HOFFA (AUS) (2002). 9 wins to 1700m, MRC Sir Rupert Clarke S., Gr.1. Sire of 233 rnrs, 147 wnrs, inc. SW Bon Aurum (MRC Sir Rupert Clarke S., Gr.1), Bons Away, Deiheros and of Top Sight, Sweet Emily, Bon Amis, Don't Give a Damn, Best Hoffa, Gibbon, Sallanches, Ambitious Speedy, Ample on Offa, Bon Elise, Bonee Tess, Galaxy Warrior, Good Offa, Hoffsetter, Never Without You, Vintage Bon, Allez Chival, Bon Rocket, Bungalally Belle, I'm Ablaze, etc. BON AURUM (c. by Bon Hoffa). 5 wins-1 at 2-at 1200m, 1400m, A$598,550, MRC Sir Rupert Clarke S., Gr.1, Caulfield Guineas Prelude, Gr.3, VRC Pin & Win S., L, Sofitel H., L, 2d MRC Willhillwolfpack P., 3d VRC Elizabeth Dunkley & Jason Lee H., MRC Moniek Sambor Tile Import H.
Gold Hoffa (f. by Bon Hoffa). 4 wins. See below. Miss Galato (f. by Skalato). 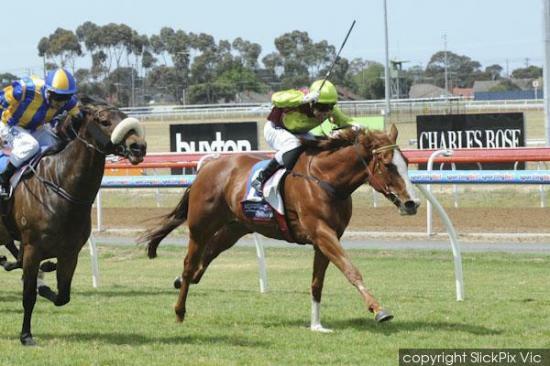 2 wins at 1300m, 1400m in Aust. Golden State (g. by Domesday). Placed at 3 in Aust. No Fixed Address. 3 wins at 1150m, 1200m in Aust. Goldsmobile. 2 wins. See above. Legs to Heaven. Winner at 2, TTC Launceston Parish 2YO H., 2d TRC Paul Geard H., 3d TTC F&W Stewart 2YO H.
Startling Power. 5 wins at 1200m, HK$4,491,025, to 2017-18, HKJC Tai Tong H., Kranji H., Po Yee H., Shing Yip H., Middle H., 2d HKJC HKU Alumni Association H., Lai Chi Chong H., Shantou H., Po Leung Kuk Centenary Cup, Dai Wah H., 3d HKJC Mody H., Flamingo H., Sha Tin Hoi H., Tung Wah Group Challenge Cup. Phantasmagoria. Winner at 1200m, 2d TTC Balmoral on York H., Tradies/Ladies Raceday H.
YOUNG RUNAWAY (Young Generation). 4 wins-2 at 2-from 1000m to 1700m in GB and Germany, Doncaster Champagne S., Gr.2, Grosser Preis von Düsseldorf, Gr.2, Goodwood Court Hill S., Tegleaze S., 2d Newbury Horris Hill S., Gr.3, Sandown Solario S., L, 4th Royal Ascot St James's Palace S., Gr.2, Sandown Mile S., Gr.2. Sire. BATTEMENT DE COEUR (Beldale Flutter). 2 wins at 1900m, 2000m, Longchamp Prix de la Table, L, Deauville Prix des Enclos, 3d Chantilly Prix Mackensie-Grieves, 4th Longchamp Prix Major Findolin, L.
Brave Ivy (Decoy Boy). 5 wins to 1500m, 2d Rome Premio Tullio Righetti, L, Varese Premio La Novella, L. Producer. Yao - Super Wins (Mal.) (Choisir). 2 wins-1 at 2-at 1100m, 1400m, 2d ARC Great Northern Foal S., L, Avondale JC Falls Restaurant H., Hawkes Bay Sunsmart 3YO H., Rotorua RC Sudimahotels.com H., 3d CJC Christchurch Casino 3YO H., Waikato RC Raffles Farm H., 4th Waikato RC James & Annie Sarten Memorial S., L.
Kyelldee (Nothin' Leica Dane). Winner at 2, WATC Jolly Aster 2YO H., 2d WATC Belmont Classic, L, Belmont Oaks, L.
TATVAN INCISI (Scarface). Champion 3YO Filly in Turkey in 2015. Champion Female Sprinter, Grass Mare & Older Mare in Turkey in 2016. 16 wins-3 at 2-from 1200m to 2100m to 2018 in Turkey, Istanbul Karadeniz, L-twice, Kisrak, L, Harem, L, Marmara, L, Zübeyde Hanim, L, Zühtü Erisen, L, Tali Calbatur, L-twice, Ankara Adnan Menderes, L, 2d Istanbul Gazi Derby, L, Harem, L, Zübeyde Hanim, L, A Cemal Kura, L-twice, 3d Istanbul Trophy, Gr.3, 4th Istanbul Trophy, Gr.3, Ankara Cumhurbaskanligi, L, Istanbul Harem, L, Istanbul Trophy, L, Zübeyde Hanim, L.
El Ganador (Unaccounted For). 6 wins-2 at 2-from 1000m to 1600m in Turkey, 3d Istanbul Fatih Sultan Mehmet, L.
4 wins to 1300m, A$80,495, 3d MVRC Sportingbet 2YO P.
Produce Record: Dam of one named foal. 2016 c. Gold Current, by Kuroshio. Unraced.